Your 가장 좋아하는 Nian day? Do 당신 miss nian as a couple?? The fans pick: YES, this is so damn painful!! It's KILLING me!!! When do 당신 think they'll get back together? Do 당신 think they'll get back together? The fans pick: Definitely! They're meant to be! When did Ian & Nina 날짜 vs when Damon & Elena dated? When did Ian start dating Nicki Reed & are they still together? will nina dobrev and ian somerhalder 날짜 in season6 vampire diares??? "We didn't break up because anything bad happened 또는 because there wasn't 사랑 또는 friendship. I 사랑 him, and the friendship is still strong and I think he's great and I care about him...We were 프렌즈 long before we dated and we still are now. I haven't been able to fall asleep. I've tried distracting myself 의해 playing games and watching tv but its still no use. So I'm just going to think about the break up issue rationally. It started with an innocent 질문 from a fan: What do the actor and his character Damon Salvatore have in common? 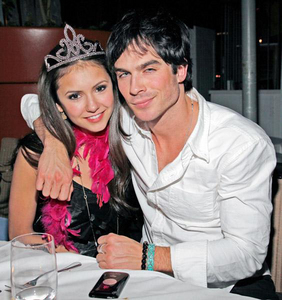 A new 신고 claims Ian Somerhalder just can’t wait to propose to his ‘Vampire Diaries’ co-star, Nina Dobrev! Ian Somerhalder, the smoldering 별, 스타 of hit 텔레비전 show The Vampire Diaries, is dying to put a ring on his girlfriend, Nina Dobrev! But sources close to the stars say that Nina is in no rush! It was a quiet morning. Nina could hear the little birds sitting on the roof and 노래 their lovely song. The sun was shining through a little whole which the curtains offered. She could hear people walking on the streets and talking in french. She understood nearly everything but right now she just didn't want to face 또는 hear other people. She could smell something like croissants and baguettes and 꽃 and something sweet which she didn't know. She was trying to figure out why she could smell all this things but then she recognized that the window was a bit opened. Ian walked through the crowd with two drinks in his hands. He was happy that even if there are a lot of 팬 it isn't as heavy as the thought. Especially Nina was very concerned because of the 팬 and groupies. Ok she loves them, Ian does as well but sometimes they just need some privacy and they want to enjoy their time. Both of them know that they can't show their 사랑 as normal couples because Kevin and Julia and most of the others from the cast don't know about them -yet! a comment was made to the poll: Do 당신 hate Nikki Reed because of Nian?